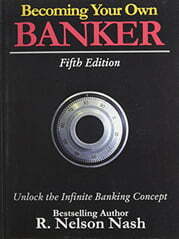 The Infinite Banking Concept was developed in a flash of revelation by Nelson Nash in the early 1980s and it resulted in the 92-page best-selling book “Becoming Your Own Banker – Unlock the Infinite Banking Concept” published in 2000. Nash realized that the proper use of dividend-paying whole life insurance from a mutual company could eventually allow anyone to “become his own banker”. This means that anyone could accumulate the resources to invest in passive income generating assets and also obtain their lifetime financing needs for cars, vacation, businesses, professional practices, retirement income, children’s or grandchildren’s college education, and home purchases from policy loans and dividend payments, rather than from traditional banks or other financial institutions, and in the process, increase his wealth by a substantial amount over a lifetime. Infinite Banking is an uncommon no-nonsense approach to sound cash management. Substantially increase your wealth by properly laddering your banking policies. Eliminate 100% of your debt in 5 to 7 years, including in most cases your home mortgage. Eliminating debt allows you to increase your wealth. Redirect towards you the 34.5% of your disposable income that typically is transferred to banks and financial institutions in the form of interest payments. Obtain guaranteed access to credit. When cash is available, opportunities will seek you out. In fact, you could leverage the cash in your policy to invest in passive income generating assets and simultaneously use that passive income to repay your loans and acquire new banking policies. The opportunities are infinite; only limited by your imagination. Obtain guaranteed tax-free continuous-growth cash value with no exposure to the stock market. Obtain guaranteed tax-free retirement income. The Infinite Banking Concept has changed the lives of hundreds of thousands of individuals, families and business owners and we at Universal Wealth Managers specialize in designing optimal Infinite Banking Systems based on your specific needs. Are you ready to get started? 1) Watch the video “Becoming Your Own Banker” in the Resources Tab. 2) Watch the video “Why Your Infinite Banking System?” in the Resources Tab. 3) Purchase Nelson Nash’s book “Becoming Your Own Banker – Unlock the Infinite Banking Concept” and read quickly through the book. For your convenience, we have made it available for purchase in our website. 4) Contact us to schedule a personal or virtual meeting to go through your thoughts, ideas, and questions. Read The Book. Order It Now!